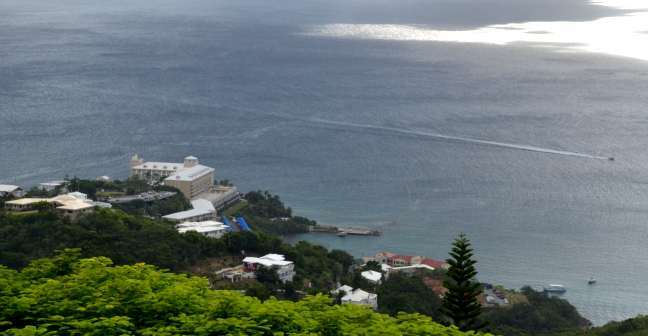 A few steps from the cruise ship dock in Charlotte Amalie, St. Thomas US Virgin Islands, we found a taxi to town. After a bit of shopping we ended up on an unplanned random bus tour of the island. 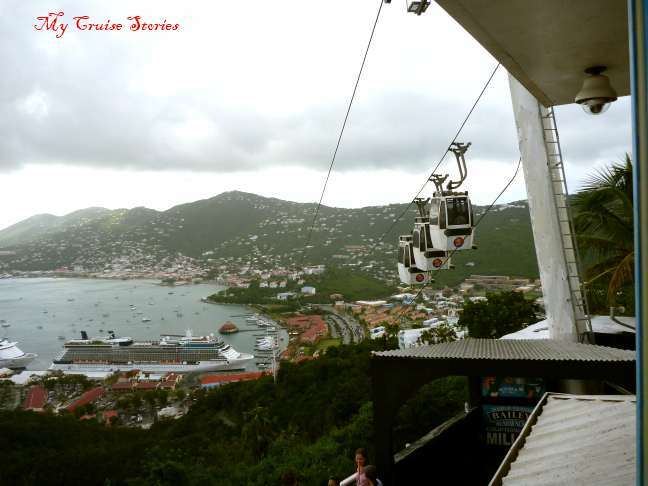 Luckily we still had a bit of time left after the tour because we really wanted to try the St. Thomas Skyride before returning to the Carnival Liberty. 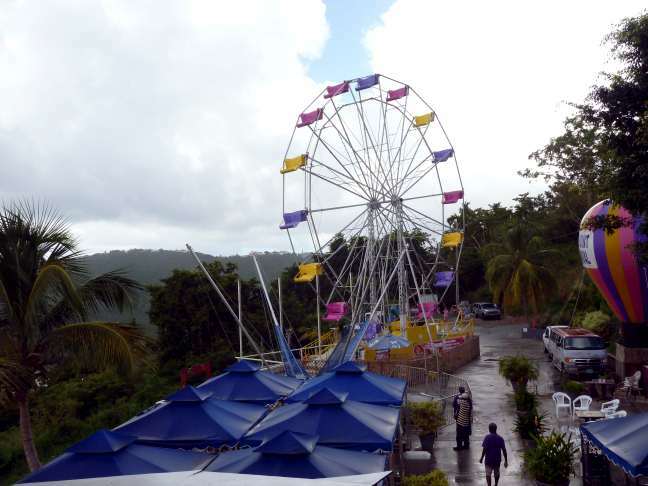 Our random tour bus let us off at the entrance to the St. Thomas skyride near the cruise ship dock on the outskirts of Charlotte Amalie. Expecting tickets purchased on sight to cost less, we felt a bit surprised to find they actually cost $2 more than they would have if we’d bought them on the ship. Just a couple people already stood on the platform waiting for the next tram, and one more joined us before it arrived. The tram comes in a group of 3 separate cars bunched together. They loaded each group into a separate one since there weren’t many of us. With a longer line, they’d have filled the cars full. We took some nice photos during the 7 minute ride to the top. An open spot on the side of the tram car offered a place to take glass-free photos. At the terminal the trams moved slowly through a semi-circular track next to a paved walkway giving people plenty of time and space for everyone to get out. A gazebo perched high on the hill near the Paradise Point tram station looked like a good spot for photos. 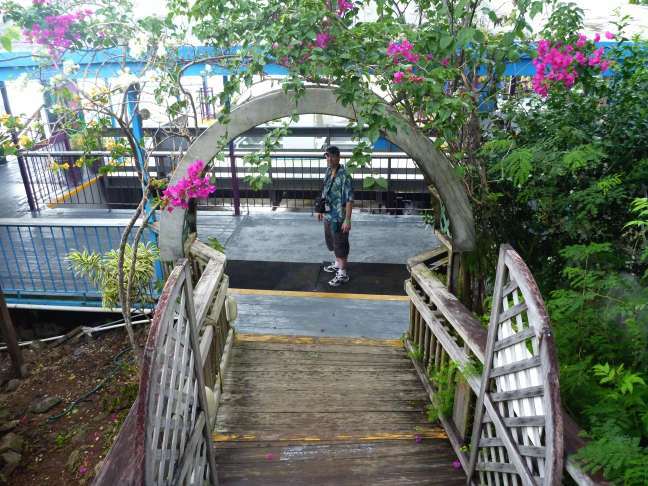 After disembarking from the tram we walked up some wooden stairs and headed toward the gazebo on a walkway lined with fragrant flower bushes. A bright colorful ferris wheel never moved while we were there. Whether it was not open or just didn’t have any customers at that time I don’t know. 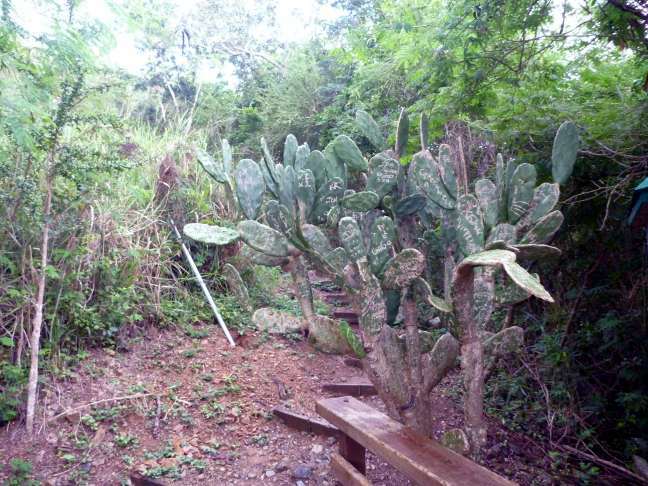 A short looped walkway had a pen with peacocks and goats, a few caged birds and a sign pointing the way to a nature trail we didn’t have time to hike. On the other side of the tram station we found a gift shop above a bar and restaurant. The balcony there offered great views of the cruise ships at the dock. While taking a picture, the tram cars went by. That balcony made a great place to photograph them as well. Suddenly it started to rain. The sky around the boats misted up, making it hard to take any halfway decent pictures. We tried the old if you don’t like the weather wait 5 minutes trick. Sure enough the skies cleared up and we took some nice pictures. 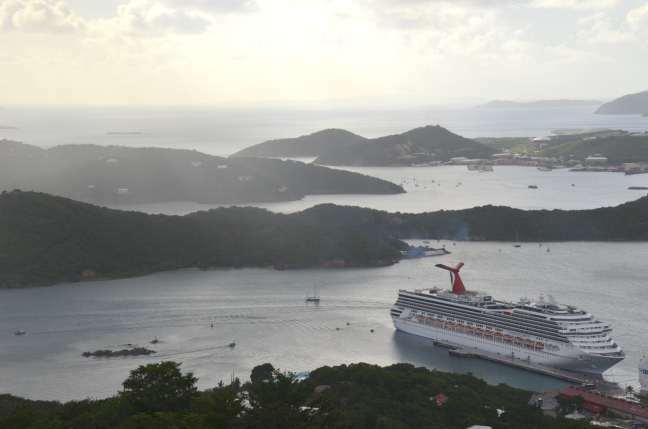 Besides the cruise ships, Paradise Point offers great views of Charlotte Amalie harbor, Water Island, the hillside covered in tropical plants, the ocean, and Puerto Rico. A small group of heavily panting people joined us on the platform, appearing somewhat exhausted after having walked up the very steep 700-foot high hill rather than riding the Paradise Point Tramway. People say Paradise Point has great night views, however due to the scheduled time of our ship’s departure we could not stay to see that as we did not wish to miss the boat. We caught the tram back down. About half way there the wind kicked up and it started raining again. The open bit above the door glass that came in so handy for picture taking on the way up became a place for cold rain to blow in on the way down. Rain from which the tram had no place to escape, the raindrops hitting us no matter where we chose to stand within the limited confines of the tram car. 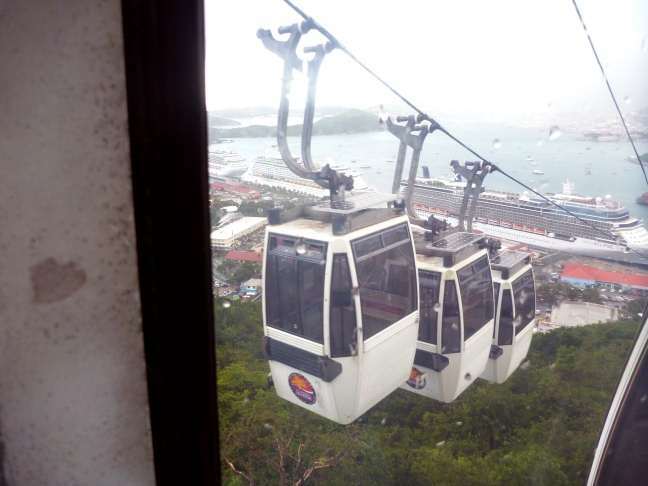 By the time we got to the bottom, the rain poured down heavily and the wind blew, rocking the tram cars back and forth as they made their way back up the hill. Feeling quite glad we had gotten out of the tram before the wind got quite so bad, we tried standing under the roof of the tram station for awhile, hoping the 5 minute thing would work again, but it didn’t. We had to hike the short distance back to the cruise ship dock in a downpour. Once we reached the shopping area we sheltered under overhangs wherever possible. By the time we reached the ship we were soaked. After waiting through the usual line to get back in and passing through the security check, we hurried back to our room for dry clothes. 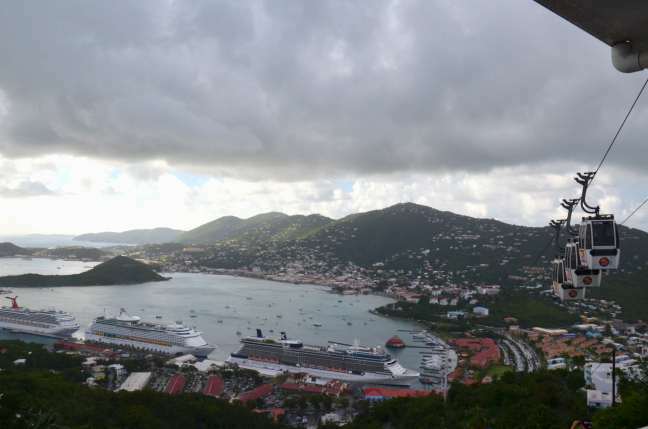 This entry was posted in Caribbean, Carnival, Liberty, Shore Excursions and tagged Carnival, Charlotte Amalie, cruise, island, Paradise Point, photos, skyride, St Thomas, tram, travel, view. Bookmark the permalink. Even on a cloudy day with on and off rain the views were spectacular. 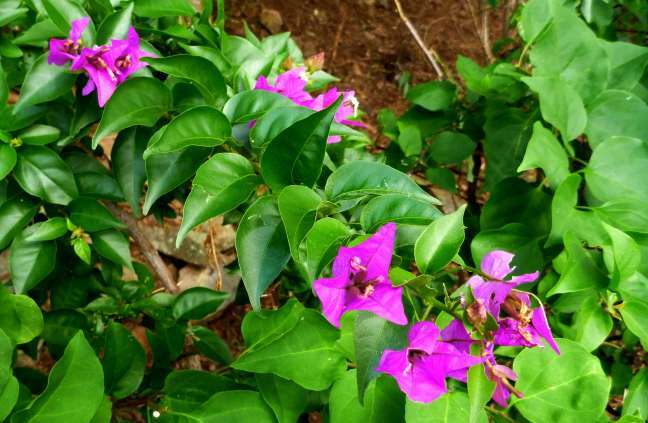 More so than they look in photos taken under a cloudy sky. 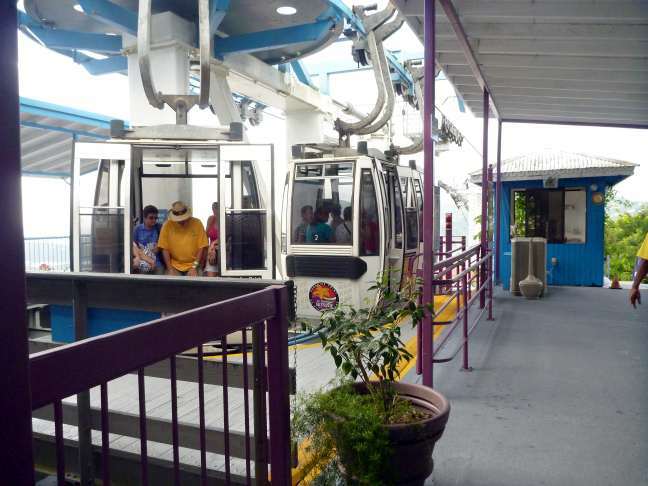 It looks similar to the sky tram we did in Alaska or the the rain forest tram we did in Australia. 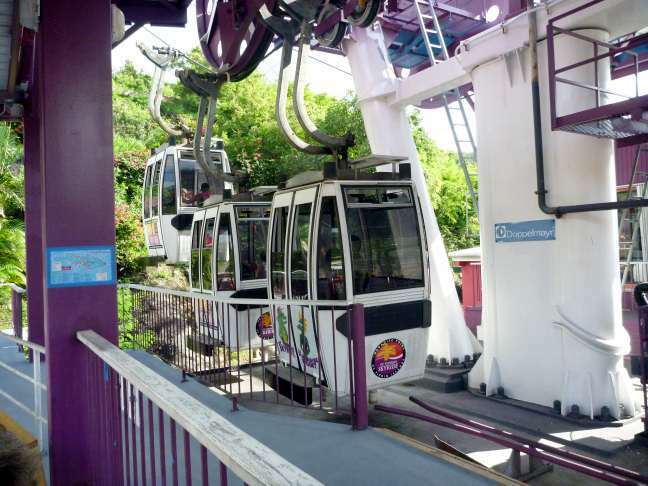 The tram rides are fun and offer good views anywhere there is a steep hill and someone willing to build one. Always a wonderful trip you take us on. Wonderful pictures. This is a great way to get a good view of the island and your cruise ship. There are quite a few stairs so be aware if that’s a problem for you. The trams are hot when they don’t move, but as soon as they start going they cool down well enough. You can go back up and down all day if you want.